H&F Conservatives Say No To Advertising Standards Authority And Press Complaints Guidelines Leaving Residents To Ask Why? Should H&F Council’s so called “newspaper” be covered by the same Press Complaints Commission guidelines that govern all other national and local newspapers in our country? Should all H&F Council’s advertising be covered by the rules set out by the Advertising Standards Authority? The answer is a definitive “No!” – or at least that was the answer given by the three Conservative members of H&F Council’s Standards Committee last night when considering a code of practice on Council publicity. In fact, all three Conservatives councillors who sit on the committee argued that it was “party political” for me to even suggest that the Council’s "newspaper" should be subject to the Press Complaints Commission guidelines. They made a similar ill-tempered point when I suggested the Committee recommends that H&F Council’s advertising should be governed by the same rules of fairness and honesty that cover messages from McDonald's, Coca Cola, Pampers nappies or any other UK advertiser. The Press Complaints Commission guidelines would require the taxpayer-funded Council "newspaper" to attain basic standards of professional journalism. 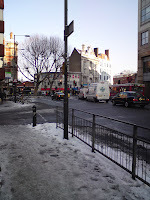 These would also, for example, have provided those residents who wrote in to H&F News to complain about an item on the Goldhawk Road Industrial Estate Property Scheme a chance to have had at least one of their letters published instead of being refused by the Council’s Press Office. Thames Water would have been able to reply to the misleading nonsense H&F Council printed about an imaginary “giant crater” in Ravenscourt Park and Furnival Gardens and residents would have been more fully informed as a result. The wording, voted through by a majority of independent and Opposition Standards Committee members, can hardly be seen as contentious. It reads “we consider that there is other guidance such as the Advertising Standards Authority and the Press Complaints Commission which might play a role in relation to Council Advertising and newspaper publications respectively”. I can’t understand why the three Conservatives voted against this. It makes me concerned about what they think it will stop their Council Administration from doing. It will be interesting to see if the Council's Conservative Cabinet overturns the Standards Committee's recommendations or not. The Advertising Standards Authority rules and Press Complaints Commission guidelines are there to protect citizens. While some sufficiently wealthy and motivated people can always take legal action if they believe their Council is behaving outside the law, most people are not in the position to do that. So, the ASA and PCC will provide residents with an effective route to correcting anything they feel does not meet the most basic standards of honesty and fairness. I hope this approach is adopted by H&F Council. I will let you know what happens. The Standards Committee meetings are open to the public and the press. 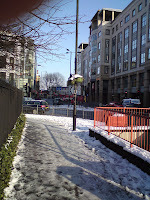 The next meeting is scheduled to begin at 7.00pm on 1st April 2009. 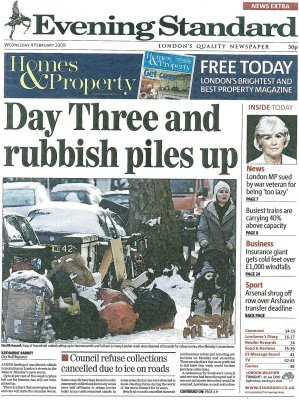 Hammersmith and Fulham Council is on the front page of tonight's Evening Standard. The Standard has picked our borough out as one of those that have "already missed out on their weekly collection" and goes on to say that "rats will be desperately seeking food and shelter" and that "uncollected rubbish lying around on the streets will be extremely attractive to them". The Standard makes a good point. To be fair though, it's worth noting that H&F isn't the only local authority in this position. 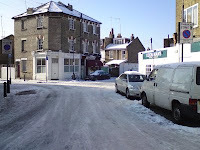 But, it was the only London borough not to have put grit onto its streets when the snow fell because they failed to plan properly, cut essential resources and couldn't get their machinery to work. As a result, our Council are stuck in a game of catch-up, which is why they're yet to collect much of our waste and have managed to gain centre stage for bad practice in the process. H&F Council told the Standard that they will now put on "extra shifts... so as much as possible of the waste and recycling is collected". 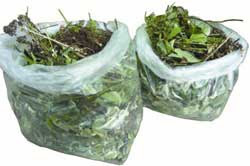 However, they have posted a comment on their website that seems to contradict this telling residents "The new combined refuse and recycling collections that were scheduled to take place on Monday 2 and Tuesday 3 of February were suspended. 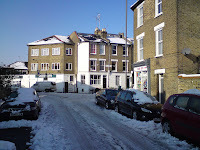 This refuse and recycling will now be collected on Monday 9 and Tuesday 10 of February". I hope they manage to get their act in order for the sake of all of us. Please email me here if you are experiencing any problems and I'll do all I can to help. 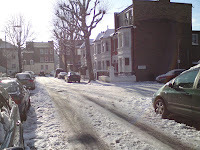 Why are Hammersmith and Fulham's streets and pavements still covered in snow and ice while our neighbouring boroughs have managed to clear all their main roads and footpaths? Well, it turns out that H&F Council didn't start working on the problem until yesterday. 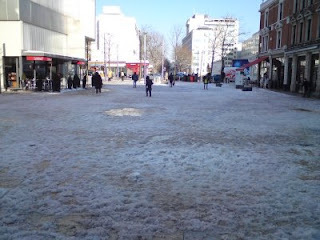 Considering that there have been predictions of bad weather since last Friday, it is unacceptable that there was no clearing on Sunday night when the first snow fall occurred. What's the reason for this? 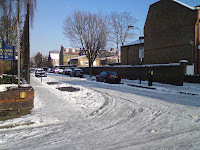 It's because our Council and its contractors couldn't get their gritting machines going. It was not until yesterday that the machines were fixed and set to work, but they then promptly conked out again at 7.00pm - begging the question why weren't the machines properly serviced earlier? 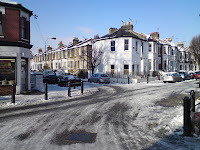 Beautiful as many of these scenes are, snow and ice are very dangerous when left on roads and pavements causing accident levels to rise significantly. Heavy traffic seems to have dissipated some of the ice on the main roads. 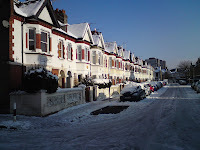 However, all the residential streets were still packed solid at midday today. 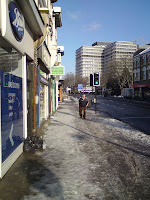 And, all the borough's main footpaths were still untouched by any gritting as today's photos show. Some civic-minded residents have taken it upon themselves to step in where H&F Council has failed. 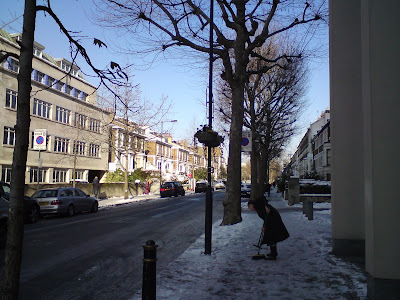 The lady in the above picture was doing her best to clear the pavements on Hammersmith Grove. She told me that she had been doing the same in Lyric Square and had been supplied with hot coffee by a local café grateful for her efforts. 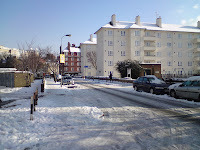 Residents will recall that the street cleaning budget has been cut by £1million. 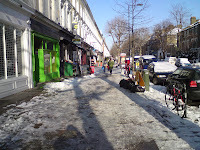 This includes snow and ice removal and may prove to be a false saving if anyone injured on Hammersmith and Fulham's icy pavements decides to sue the Council for negligence. I will report more as this story unfolds. 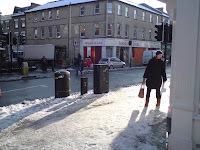 Click on any of the pictures (taken between 11.25am and 1.10pm today) to enlarge.